Detailed guide with helpful information on fees, costs, requirements, licenses, formation, and hiring. Also includes tips, FAQs, and a checklist. With great access to working capital and community support, Maine is a good place to launch your new business. In 2018, there were nearly 150,000 small businesses, making up 57.3% of Maine's workforce. 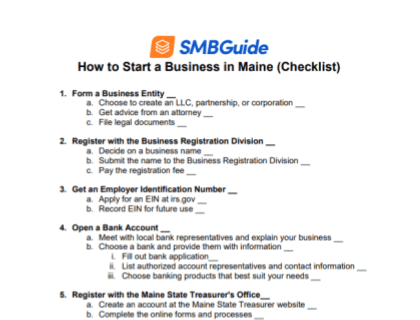 Download our detailed step-by-step guide to help launch your new business in Maine. 1. Decide on a business structure. A Sole Proprietorship has no legal difference between the owner and the business. Does not require filing with the state. A partnership is a legally binding agreement between two or more individuals. The partners share management duties and profits. A Limited Liability Company (LLC) is a hybrid business structure that offers limited liability to its owners. Includes certain characteristics of both a corporation and a partnership or sole proprietorship. A corporation is a formal legal structure. It is authorized to act as a single entity and is recognized as such by law. There are different taxation benefits associated with each business structure. You need to ensure your business structure is financially beneficial, with good liability protection. Most small business owners prefer opening an LLC because of their flexibility and tax benefits. Depending on the circumstances, an LLC may choose to use corporate tax rules instead of being treated as a partnership. It combines the limited liability of a corporation with the availability of pass-through income taxation of a partnership. You can set up an LLC business in Maine for $175.00. File the Certification of Formation. 2. Register your business name. By law, your business name has to be registered with the Maine Secretary of State (SOS). However, before you can register, you'll need to ensure your business name is not already on file with the SOS. To check name availability, visit the SOS website and perform a corporate entity name search. By filing an Application for Reservation of Name online with the Maine SOS, you can reserve an available business name for 120 days. If you wish to file offline, you can download the form and mail it to the SOS. Mailing information is available on the form. There is a $20.00 filing fee included. Learn more about how to name your business. 3. 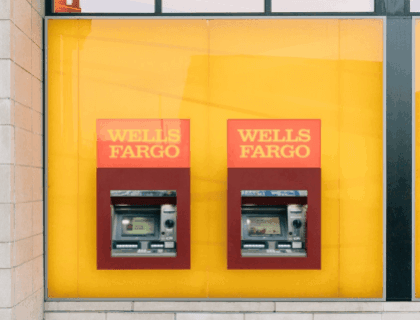 Get an Employer Identification Number. 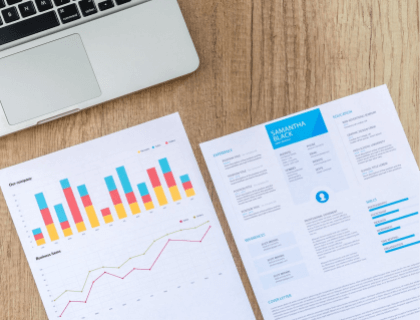 If your business is taxed separately from you, or if you plan on hiring employees, you will need to acquire an Employer Identification Number (EIN) from the IRS. 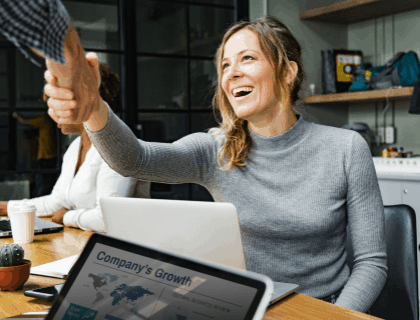 Even if your business doesn't require an EIN, it's beneficial to have one as some banks expect an EIN to open a business account. You can complete an online application on the IRS website. There is no required filing fee. Your business and personal bank accounts should remain separate if you want to ensure your finances stay organized. Find out about the different fees and business bank accounts available by visiting your local banks. 5. Register with Maine Revenue Services. If your business sells goods, you need to register for Sales Tax with the Maine Revenue Services (MRS). Furthermore, if your business has employees, you must register with MRS and the Maine Department of Labor (DOL). You can register online by filing an online Tax Registration form. If you wish to mail or fax the form, you can download the form and mail it to the address provided on the form. There is no filing fee. 6. Hire employees and report them to the State. Each of your newly hired and re-hired employees must be reported to the Maine Division of Support Enforcement & Recovery. This process must be repeated every time you employ a new staff member. The employer must report employees, whether full-time, part-time or student worker, within 20 days of employment. You can report a new hire online. You will need to create an account to access the online services. You can also report employees by fax or by mail. Simply download the form and follow the address information at the bottom of the form. Employer's Federal Employer Identification Number. 7. Obtain applicable state licenses and permits. Depending on the type of business you own, you may need special licenses or permits to operate in the state. In Maine, general licenses are handled at the town or city level. To find out what licenses your business needs, contact the city office where your business is located for more details. You can find contact information for town offices through the Maine.gov local government section. If your business provides a professional and occupational service you may also require a particular license and permit. You can search the list of state-issued professional and occupational licenses in the Resources by Profession division of Maine.gov. Any Maine business owner that hires one or more employees is required to carry workers compensation insurance. Domestic workers are exempt. For more detailed information about exemptions, visit the Maine Bureau of Insurance. Minimum automobile insurance for business drivers is also mandatory in Maine. In addition, if your business uses your truck or car, a commercial vehicle policy is recommended. 9. Keep up with on-going requirements. Over time, business regulations can change, which may result in new processes and additional registration. Therefore, it's important that you stay informed on the various laws or regulations that could affect your business and industry. If you form an LLC or corporation in Maine, you will need to file an annual report by June 1. For efficiency and quick results, you can file online at the SOS website. There is an $85.00 filing fee. You also have the option of mailing your report. How much does it cost to register a business name in Maine? It costs $20.00 to register a business with the Maine Secretary of State. Where can I apply for a Maine sales tax license? You can apply for sales tax by filing a Tax Registration form, or go here. Are there any specific rules for an LLC in Maine? In order to register your LLC, you must file the Certificate of Formation with the State of Maine. You can file online, by mail, or in-person. The filing costs $175.00. In Maine, an operating agreement is required. Do I need workers' compensation? Yes, you are required to carry workers compensation if you have one or more employees. How do I register a business name in Maine? You can register your business name with the Maine Secretary of State. You can visit the SOS website for the proper documentation.